My first canvas painting of "Sunlight in CA Trees" is almost finished. I want to add more green grass to the right side, and darken the the light branches of the front two trees. Here's how it looked in June. I have started to add found objects to my artwork, mostly as framing elements, all natural plant pieces from my lovely botanical garden. This is a simple frame of tree branches. Slowly making my way to the end of the sunny path with this painting. Almost finished the ground and grass. Then I'll paint in the trees and touch up the sky. Here's where it was in March. The next version of my favorite scene of Nevada City, CA. Now turned into the series "Sunlight Through California Trees" after renamed for a (successful) submission to a commercial calendar produced by the Aquent Creative Agency. I've done my first painting pass, washing in the basics of all the trees. I sketched the blue underpainting in mid-November but then only stabbed here & there at the canvas for a month. A nice end-of-year treat (though I'm posting just after the new year start). My artwork was chosen for a page in a 2016 calendar that Aquent publishes. The calendar is portrait format and my original painting is landscape format, so I had to do a lot of unfortunate Photoshop squishing once I received the news. But... still kinda cool. I'm Ms September. ;) Here is the original painting. I've been pick-pick-picking at this painting again. 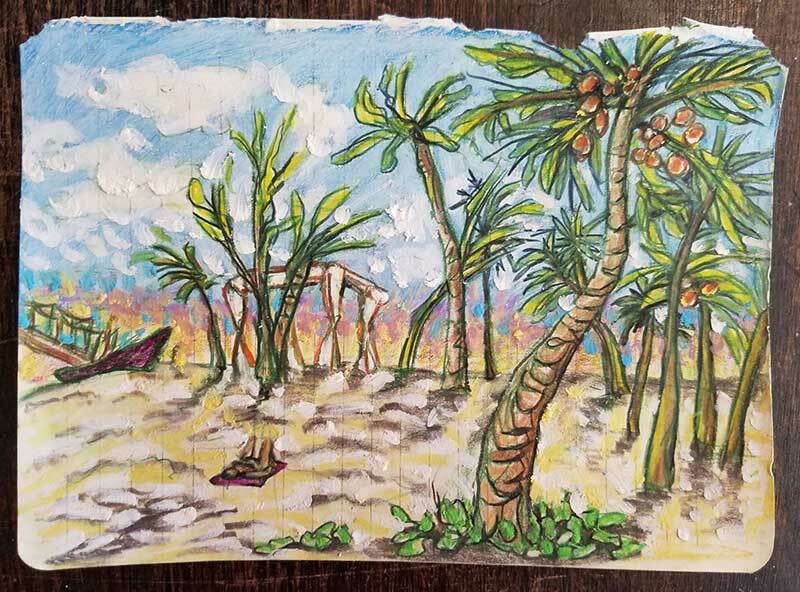 It's on 8x10" paper and I last worked on it a year ago. 'Bout time for its anniversary finale. I'm enjoying the patterns that have emerged, and getting playful with them. But I think the scene is getting too busy now so I'll make a couple of tweaks to add contrast and call it done. Also want to remove the experimental green leaves that I added to the tree in the left foreground. That's gonna be tricky. Here's where the piece was a few days earlier, before I got a little crazy with the green paint and cheese whiz. Need to get back to the branches' starkness, if possible. And just for the helluvit, here's my studio setup for small pieces. Second go at my Nevada City Trees is looking good. Moving from 5x7" to 8x10" requires a shift in the design structure, and the color palette inevitably shifts along with it. This version has more purple and gold in the first layer of paint. I've also thought about how the sky and ground meet, simply from almost botching the skyline in the first painting. The paint will be dry enough by this weekend for the second layer. Here's the earlier stage. I’ve started two new paintings, or rather, new versions of scenes that I’ve done before. Along with this effort, I am starting to track the time that each piece takes. A goal for 2014 is to gather enough work for a gallery show, and for that amazing event, I need to figure out reasonable pricing. So I’m adapting the system that I use to timetrack my freelance writing. Once I know how long each piece takes, I can average that time and figure out how to price the work. Anyway, here are the sketches for my two new(ish) pieces. 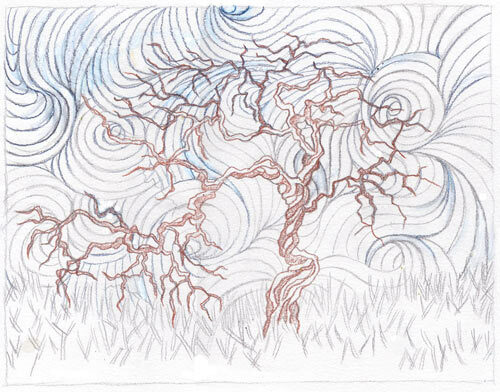 It’s my favorite swirly Anderson Valley tree again, and the Nevada City tree grove that I did a few months ago. The previous paintings were 5x7”. This time, I’m working at 8x10”. Getting bigger & better. I finished my first Nevada City piece, and am comparing the final to a stage 3 that I didn't blog. After stage 2, I filled the sky with blue and the ground with more tan colors. But the piece seemed flat. Finally I looked at my source photo and realized the heavy sunlight had attracted me to the scene. So I added in strong yellow light, which led to lighter greens in the surrounding field, and more dark blues along the edges. Now it's popping!